This is Lawrence the executive director and I wanted to speak personally to all of you. It's time for a candid update about both our organization's recent past and our future. It is also best to get the facts from us rather than from someone who is not from within our organization. What major event has happened recently at Universe Spirit? One day about 10 years ago I was in a deep meditation and a strong thought and feeling filled my awareness. It contained the clear concept that I and our organization needed to stop our current mission focus on eco-spirituality education and focus on researching the current facts on global warming. This just came to me completely out of the blue. I really did not want to carry out this idea because as its executive director, I loved the spiritual work that I was involved in within the Universe Spirit organization. For months, I fought this reoccurring idea, but it kept reappearing in my daily meditations and it grew stronger. I finally decided to see a psychologist who had been a Luthern minister and taught at a seminary. After extensive counseling sessions trying to both reality test and refute the validity of this persistent inspiration or "calling" if you like, I finally came to accept that the Universe and/or it's and mysterious Originating Spirit was guiding or leading me toward some new, but very unwanted mission. This was also in spite of the fact that I had never before done any research in this area and, I am a hard science guy and these kinds of persistent meditative inspirational new mission thoughts were very new to me. Because both I and the Universe Spirit organization shifted our new mission focus towards warning the world about how bad global warming actually is, as opposed to what we are being told, Universe Spirit's ongoing eco-spirituality education and other related service activities had to be greatly curtailed over the past extended period. What's important now is what's going to happen at Universe Spirit with your support! Slowly we are going to go back to doing much more of our eco-spirituality and sustainability work once again, but our focus is still going to be a bit different based on the disturbing new facts we have learned about the global warming emergency. 1.) We are going to move our organizational headquarters and key staff as well as those Universe Spirit members or subscribers who want to join in the creation of building sustainable eco-communities to the far north of the United States. The first eco-community will be located in an isolated area that will remain a global warming safe zone for the foreseeable future. 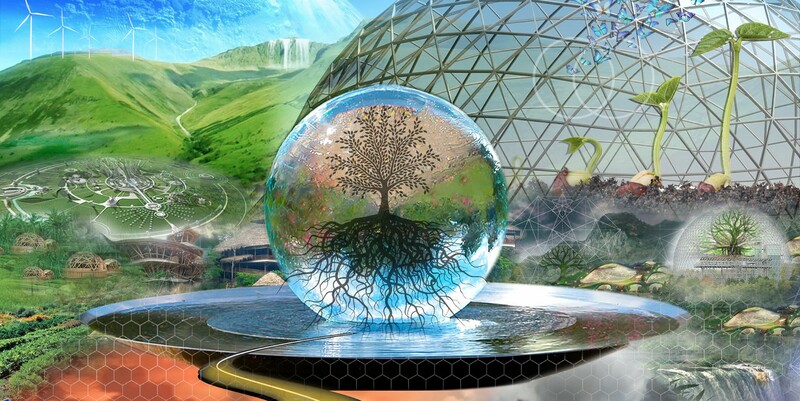 This founding first new eco-community will be based on the ideas of Sustainable Prosperity, the Job One for Humanity Plan to survive global warming and Spirituality 2.0. 2.) Our organization currently still located in San Francisco will gradually also re-begin its Spirituality 2.0. education services and sustainable prosperity training work while it forwards our new mission focus and the goals mentioned previously. To help us make this new an updated mission real as fast as possible, please make a tax-deductible online donation now. This will take you to the Job One website. Both Job One and Universe Spirit are part of Factnet an IRS recognized 501(c)(3) nonprofit. With your ongoing support, we promise we will move forward with the new Universe Spirit mission focus and goals mentioned above and we will keep delivering the truth about the world’s current failed global warming reduction efforts. We will also continue to provide deadline-driven effective actions found in the Job One Plan that will help save and preserve you and your loved ones as the escalating global warming situation deteriorates. Please make a quick and easy online tax-deductible donation here and keep our new mission alive. PS: If you don't understand how bad global warming already is or, how bad it's going to get, please take this challenge and let us prove it to you. Get the book Climageddon, The Global Warming Emergency and How to Survive It. It will prove to you using hard science what is coming is as bad as what we are saying. By this time you are probably also now asking if it's this bad, what can you do about the global warming emergency right now? That can be found in the newly upgraded Job One for Humanity Plan. Most of the open-ended processes that we associate with human uniqueness, from flexible brain development to symbolic thought and cultural diversity, reflect fast-paced evolutionary processes that take place within an architecture created by genetic evolution. We have not escaped evolution. We experience evolution at warp speed. The starship of evolution is not like the starship Enterprise, however. Unless we understand how it works, it will take us to places we don’t want to go.